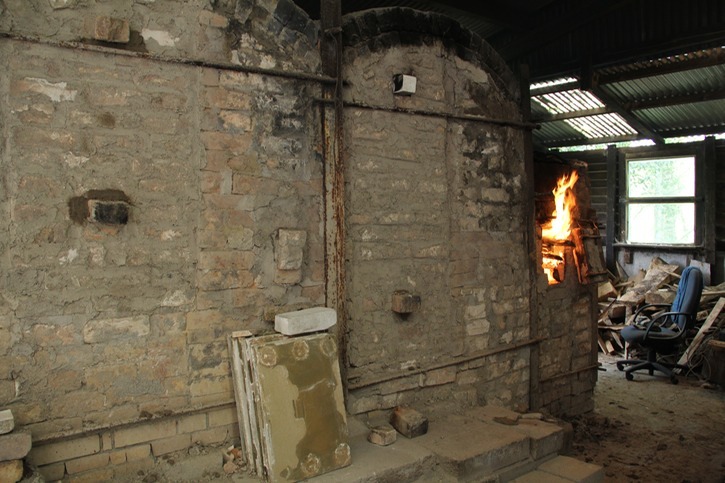 We finally fired our wood-fired kiln in early June after a series of delays, mainly weather related as May had some terrible weather this year. It is always preferable to fire in dry, calm weather as it gives you the best chance of a successful firing. 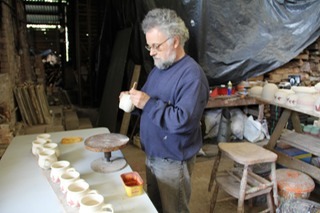 The weather forecast was great on the 5th of June so I began the preheat at 4 p.m. and gradually warmed the kiln up over a few hours. Then around 6 p.m. I closed up the firebox and let a gentle fire burn till bed time with occasional stoking. 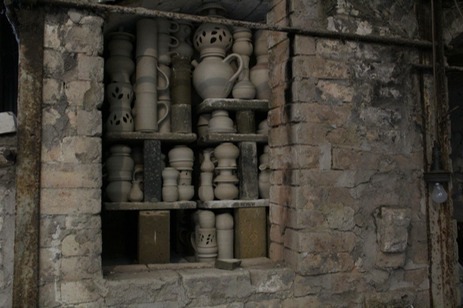 This helps to dry out the kiln and pots completely. 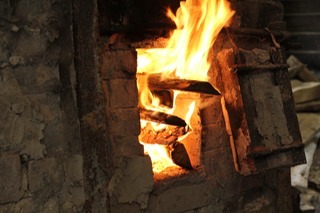 I filled up the firebox with wood at 10 p.m. sealed it completely and went to bed. 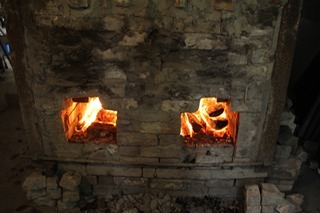 I began the proper firing the following morning at 5 a.m. when it was already light with clear skies and no wind. 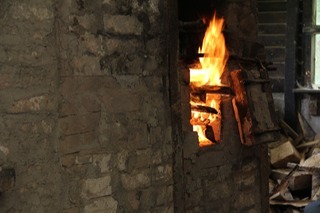 I gradually built up the fire in the ash pit and later Meredith joined me with tea and breakfast. The kiln must be attended at all times so I stayed with the kiln all day except when Meredith was stoking. 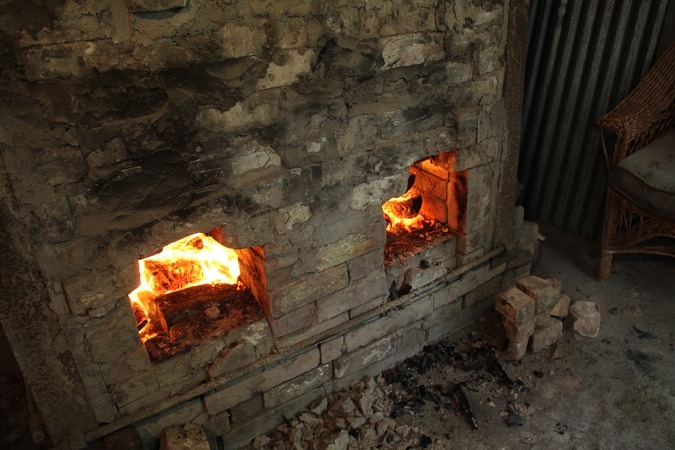 By 10 p.m the ash pits have reached their capacity so to keep the temperature increasing I block up the ash pits and begin stoking in the upper part of the firebox. 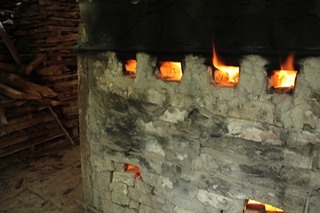 The chimney is now hot and the draft pulls the flames through kiln.The wood is burning upside down in the upper part of the firebox which is very efficient. We only have small bucket of ash after a firing which consumes about a ton or so of wood! 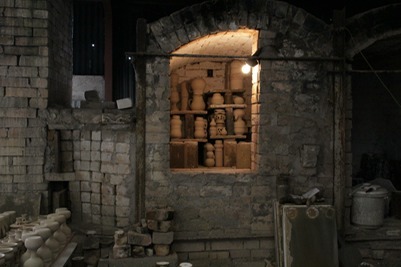 properly and the kiln temperature slowly rose. We have two chambers and a delicate balance is needed so that the waste heat from the first chamber brings the the bisque chamber's temperature up evenly. We had a difficult couple of hours when the glaze chamber's temperature was rising much faster than it should but with diligent stoking we got the bisque chamber to completion just before the glazes in the first chamber melted and we stopped firing after 13 hours, which is about the usual length of time it takes to fire the kiln. 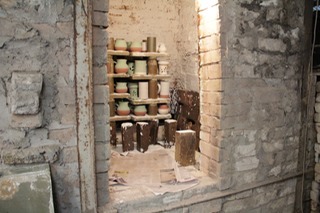 We have been loading the bisque kiln this week in preparation for the first firing of the year. 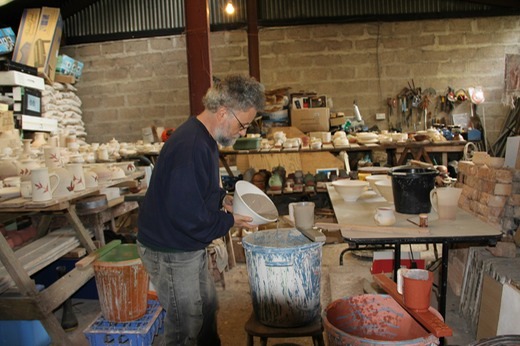 It takes about a day to load the bisque chamber but we need dry weather to bring the pots down from the workshop. This week has been perfect. Loading the glaze chamber takes about 3 days and is a very slow and painstaking procedure as no two pots must touch each other.